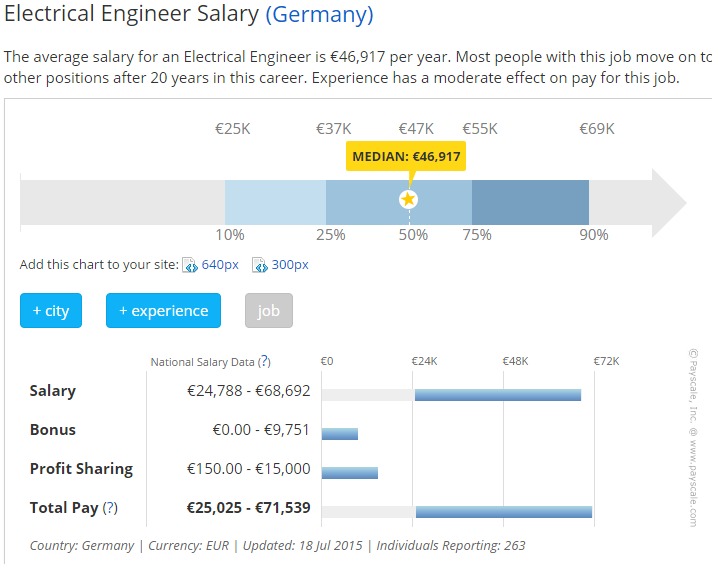 I'm often amazed at the salaries one can expect as an EE in countries like USA or AUS while those same jobs pay less in equally expensive or more expensive countries in western Europe. Europe generally has better pension and health benefits defined by law but the tax laves are quite high. The base bracket in the Netherlands is 34% income tax, going up to 50% for higher salaries (<100K euro). In the news there are often reports like "we are running out of engineers" or "Huge shortage of technicians for ..." while the salaries stay the same or even go down because of "crisis" and no indexation of some salaries. After 5-10 years of experience there is very little grow in salary unless one goes into management positions. 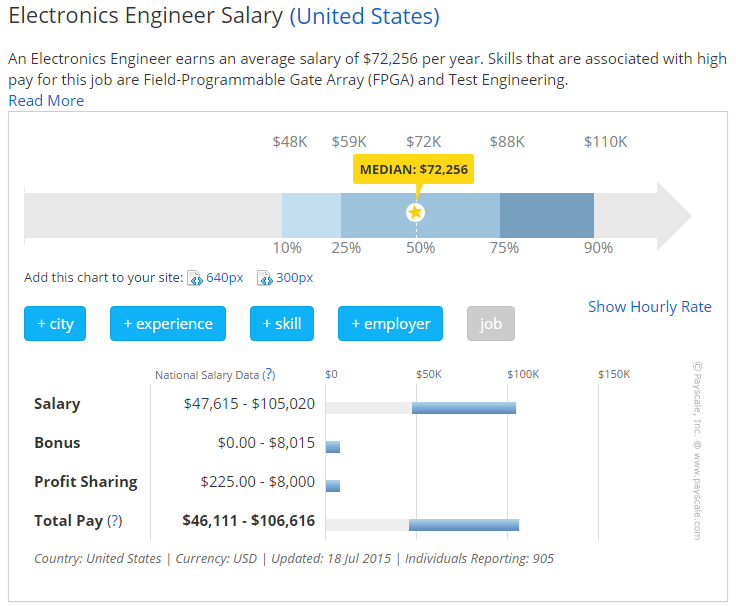 For this comparison it will be based on info on payscale.com for a Electrical engineer. Ex income tax. 68K AUD is 45K euro, from what I have heard 70-100K is possible with some expirience (100k = 67k euro). Of course there are many deductibles but those are to hard to list here. Germany seems to be the best country to be an EE in. Reasonable wages, good healthcare and pension? Low house prices compared to NL and low costs of ownership for cars and motorcycles. Reasonable infrastructure(NL is better in this). Still compared to lower end jobs like non university in the technical field the EE jobs don't pay that much more for way more involvement in my opinion. With all these companies that are complaining about shortage of technicians they should really up there side of the bargain and pay more. The salaries for management and CEO's for medium to large companies is ridiculous compared to the workers. What are your experiences and opinions? The salaries for electronics engineering generally seem low compared to other branches of engineering (and it has been this way for as long as I can remember). I speculate that part of this might relate to the nature of the job. In most fields a professional engineer will have scope to expand beyond the purely technical into team leadership, project management, customer interaction and so forth. The projects themselves will generally be large capital projects and have a high value associated with them, or will involve production lines with high value products. This all may add to the value of the engineer and the salary that goes with the job. Still I'm at the opinion that the wages are low compared to other lower lever technical jobs. To get a better compensation you basically have to start your own company and do some sort of consulting. Allowing you to bill 50+ euro an hour on a regular basis. Depends on what you are doing. Someone I know is a high level PLC programmer and does one interesting project after the other all around the world. Usually projects other PLC 'programmers' can't do so there is definitely a market for high end PLC programmers. Anyway, if you are good with electronics and embedded firmware programming you can do much better than 36k euro but you have to find an employer who can turn your efforts into money efficiently. Besides all that you have to take into account that an employee costs 3 times his/her salary in the NL. As for wages I did a search on nationale vacature bank and most said "market conform salaries" and the few that showed numbers were between 2600 and 3200 ex tax a month for 5-10 years experience which seems low for me. Im not sure if this sector falls under any CAO but if it does than your not that much better off. 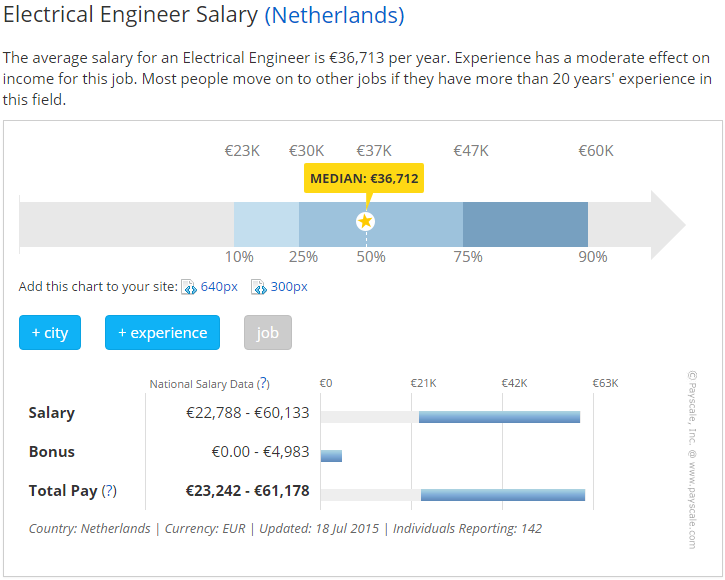 The salaries that the big one's offer like ASML several other companies out of the Eindhoven area do not seem that high ether (based on salary postings on tweakers forum). It seems that being your own boss pays off in the long run due to tax provisions but you also have increased risks and costs like additional health insurances and saving for your own pension. Now I'm not looking for a job so it is fine but I would like to know what "decent" salaries are in your experience in NL. Can be done via private message If it should not be public. As for plc programming, I have done it for about two years in an professional manner. I did my high school studies in Belgium and my teacher had his own PLC programming / Engineering company. He regularly brought work to school and let the best students work on those projects during practical lessons. In the end I ended up doing the majority of the projects ranging from automated doors to parking garages and small pick and place machines (not the smt kind but packages, pills etc...). While it was fun to do instead of the regular boring practical work it did not challenge me enough to do it for the rest of my career. 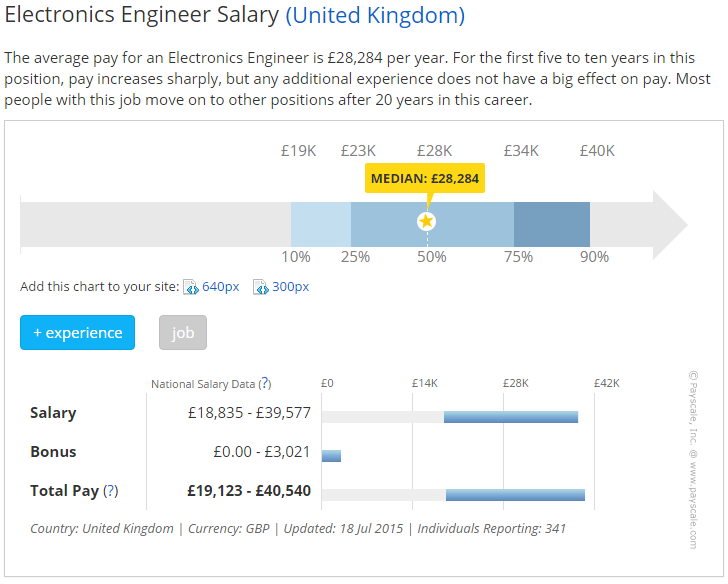 I can't remember when I last met a decent electronics designer in the UK on less than £40k. I have no idea what scope that survey used to define "electrical engineer"
I Guess it depends what industry you are in, but for semiconductors this should be higher. Once you get noticed on LinkedIn by headhunters and have some interesting skills you can expect job offers paying north of 60k euro. But people worth that kind of money are often self employed because very few employers can maximize profit & pay properly for such talent. It seems to be generally more some kind of temporary contracting work. If you earn 100k euro in USA , how much of that is actually left after taxes , healthcare and pension saving? No. For contracting you can easely double that. Yes, I'm afraid this sounds about right. We get absolute crap salaries. My job contains more administrative overhead, meeting, discussion than actual work, and there are days when I'm left without anything to do. And I know I'm doing an excellent job, even my employer thinks so. In the meantime, if I would go to Switzerland, I would earn probably 3-4 times as much as here. "Back in the old country" I had a starter (!) 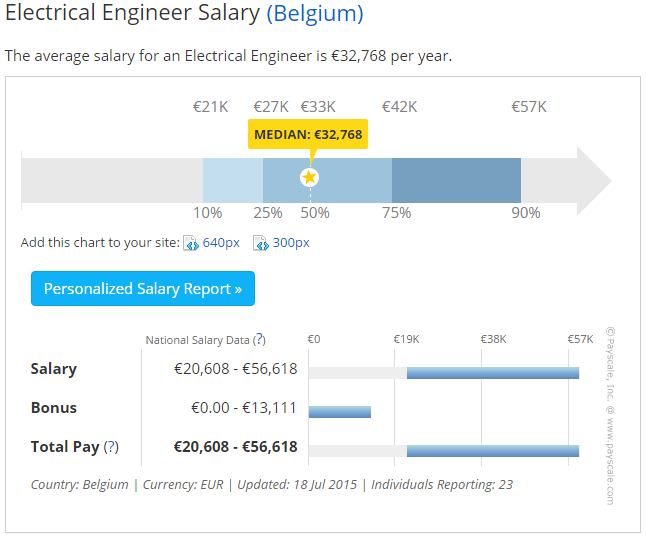 salary, which was double the nation's (pretty poor) average, here an engineer has to be lucky to even get the average. In the meantime, managers earn like crazy. It doesn't matter, get manager in your job title. There are people working at this company, who have no employees working for them, no team, no nothing, but they are managers. I was talking to some of the old engineers who were employed in the communist days (not belgium obviously). They talked about an age, when the term you are an engineer actually meant something. Like a good engineer had separate office with a workshop, some had even secretaries. There were assistants, technicians, and a whole team with mixed capabilities at your service. Now I should be glad I can pay the taxes, or go back and work for one third as I earn here. Nice future, right? Maybe I should just go on a ship and move to the US like it is the 1920's again. There is a huge range in tech salaries in the US, depending on experience, the type of company (big or small), and location. I'm a senior design engineer in semiconductors, non manager in a small company in Silicon Valley. My salary is pretty typical based on people I know, but I have none of the stock purchase plans, retirement fund matching or profit sharing benefits that you can get at a big company. Those can add up to a substantial bump. Looking at my last paystub, I pay 33% in payroll taxes. My health insurance is paid by the company. There is no retirement plan. The biggest expense here aside from taxes is housing. The median home price in the US according to Zillow.com is about $180k. In Santa Clara county, which includes most of Silicon Valley, is about $900k (and that won't buy a mansion, median is $535/square foot). That's 5x the national median! If you are a working electronics engineer in this area, you can be pretty comfortable, with nothing to complain about. But I'm sure it is a struggle for other folks who have "real" jobs to try to pay the rent and make a living here. But people worth that kind of money are often self employed because very few employers can maximize profit & pay properly for such talent. That's an excellent point. It's not enough if one is smart and works hard, somebody needs to translate that work to money to cover the salary. That's the value the employer brings in. Whether software "engineering" is considered true "engineering" is questionable (e.g. in Canada you can't be titled "Software Engineer" unless you are an actual engineer, so most of my colleagues in Canada have fun titles like "Software Developer" or the fun "Programmer"). Anyways, seems either those charts are misleading or hardware people earn less money than software people do. At least here near Silicon Valley--Which seems a bit backwards to me. Weft backward? A software engineer can provide more value because of the low production cost, margins and scalability. Hardware is becoming a commodity. Hell yes, what little else does a software type require besides salary? Ding-dongs, Dr. Pepper, pizza. I guess-I suppose I am referring to backwards in the sense that (true) hardware engineering is nuanced and software today is extremely high-level and IMO easier. So certainly not backwards in terms of value, but backwards in terms of the skills and experience required to produce said value. Such a narrow focus on pay in difference countries is unwise. Moving from Netherlands to a warzone like the USA would be a horrible life decision for the sake of a few dollars. Speaking of warzones, truckdrivers are contracted to the US military and they just look at the good pay. Then they get there and nobody tells them what their job is, they just say 'drive over there' and not mention that it's a warzone, durr. So roadside bombs blow them up, but the best part is that when they get back, they really realise what a disposable commodity they were, because "veteran" makes a great headline, like "Vet's living in cardboard boxes" whereas a contractor doesn't even get paid with a label, they can't even call themselves vets after they have no legs. Not much good having a few extra dollars when being dead, robbed, sick, or poor in practical sense is the price. Seems like people are thinking narrow, as if moving somewhere else without thinking would be a good idea. Is this what people watch in Australia?. RT is the propaganda channel owned by the Kremlin. That's right, and in the UK they watch the bbc which is the propaganda mouthpiece of the UK gov. And in the USA it's a bunch of them. I like Fox news the best. I love the hair on this one, the whole marge simpson beehive look. Actually I want to move to the USA, I can get a job as an EE and then run the teleprompter as a part-time job. I need some fire in my life, some ACTION! some real fun. Which channel is the best in the USA ? I want to work for them, but they are all so fabulous it's so hard to choose. Well, first you're comparing apples vs oranges here. An Electrical Engineer is something completely different than an Electronics Engineer, with the latter generally being paid better. 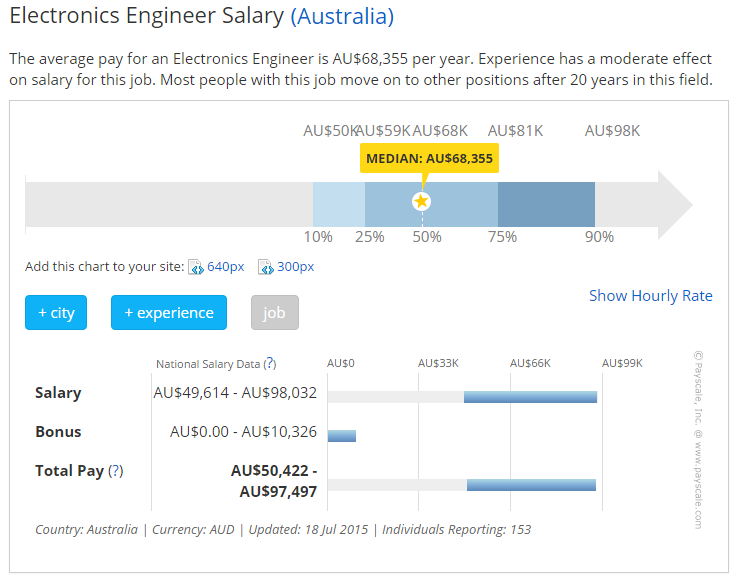 Second, "Electronics Engineer" is a pretty broad field, going from i.e. some temp in a factory doing rework on flat screen TVs that failed end test to highly skilled specialists working on the 200GHz scope. If a country has more of the former then this obviously will skew results downwards. Also, $72k may sound like a lot when converted to EUR but it isn't if you have to live in the US, especially in the high tech circles like Silicon Valley where rents and living costs are pretty much amongst some the highest in the developed world. Plus there's health insurance costs, property taxes, plus the fact that Americans in general work much longer hours than their European counterparts, all while getting less paid holidays.